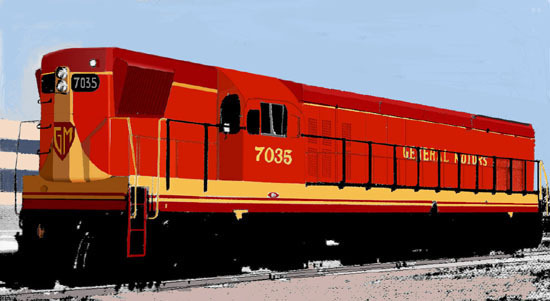 EMD 7035 G16 Co-Co 1800 hp. at the LaGrange plant. This unit demonstrated in Mexico and probably Jugoslavia and was sold to Zambia after rebuilding with a low nose. NOTE: This scan was made from a small publicity photo on a wallet size calendar card. Retouching to bring it up to acceptable display took many days. Unfortunately, underframe detal is lost for now. Photo from Larry Russell collection.